At least 40% of Americans will experience the pain of sciatica at some point in life. Whether it happens due to aging or because of an injury, you need an experienced physician like J. Michael Graham, Ph.D., M.D., to accurately diagnose your pain. At Northwest Spine Center in The Woodlands, Texas, Dr. Graham focuses on conservative treatment options to address your pain and enhance your overall quality of life. Find out more about treating sciatica pain by calling the office, or book an appointment online. In most cases, sciatica is a condition that results when a damaged vertebral disc pushes on a spinal nerve, which travels from your lower back into each of your legs. For many, sciatica produces an electrical shock sensation when you move suddenly. This jolting pain often occurs when you sneeze, cough, or laugh. You may also feel a worsening of pain after sitting for long periods of time. In addition to the shock-like pain, you may notice you have numbness or weakness in one or both of your legs. People with sciatica also experience frequent pins and needles sensations in the legs. Dr. Graham performs a thorough evaluation of your physical health to rule out other issues that may cause back and leg pain. He also reviews your medical history and discusses your symptoms. In many cases, the location and type of pain you experience can help identify sciatica-related pain. To confirm a diagnosis of sciatica, he may recommend imaging tests, like an X-ray or MRI, to get a closer look at your spine. Dr. Graham uses the results of your test to create a custom treatment plan to alleviate pain and enhance your overall quality of life. For some, sciatic pain heals on its own with plenty of rest. Dr. Graham may recommend limiting your activities, such as strenuous exercise and heavy lifting, to improve your chances of natural healing. 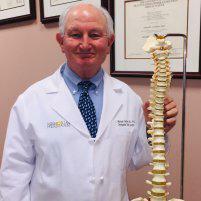 If nerve compression is severe, Dr. Graham may recommend surgery. He offers both traditional and minimally invasive surgical techniques to repair damage that causes pressure on your sciatic nerve. This may involve removal of part or all of the damaged disc. The goal of surgery is to achieve long-term pain relief and prevent a worsening of sciatic pain and nerve damage. Find out which treatment option is right for treating your sciatica pain. Call the office today, or schedule a consultation with Dr. Graham online.